View a PDF of Adela Amador&apos;s inaugural "Southwest Flavor" column here. 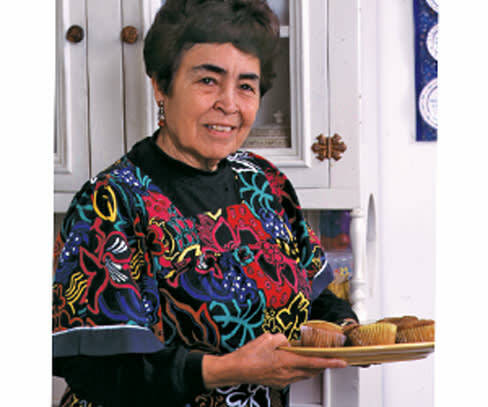 Adela Amador penned the “Southwest Flavor” column from its 1993 inception until 2006. The column wove recipes with stories of growing up in an earlier time, and became one ofNew Mexico Magazine’s most popular features. She grew up on a farm in the northern mountain town of La Madera, the fourth of 12 children. When her father was asked if they were all living, he said, “Unos vivos, y unos tontos; pero todos comen.” (Some are bright and some are dull, but they all eat.”) He often bartered apples from his orchard for pinto beans grown in the Estancia Valley. Although the family stove once blew up while Adela and her mother were roasting chiles, that did not discourage her from a lifelong love of cooking. Amador began writing the column at an age when most folks are retiring. In fact, she commented in one column that the only use she had for the word retiring was when going to bed. Her recipes reflected simple New Mexican home cooking and relied on seasonal ingredients—succulent peaches, freshly roasted chiles, new-crop pinto beans—when available. Along with other cooks of her era, she pragmatically featured canned salmon, pineapple tidbits, and Jell-O instant pudding in her magazine recipes. Like most of us who write about seasonal food in publications with long lead times, she expressed frustration over having to test asparagus recipes months before asparagus season, or tomatoes well past their time in the garden. In the magazine’s pages, she laid out her concern that growers needed to return to more sustainable agriculture, with less dependence on chemicals, and she promoted the values of composting to improve the soil.